Martin Behaim (ca. 1459-1507) was a textile trader from a Nuremberg patrician family who is famous today for his globe (or “Erdapfel,” as he called it), the oldest still in existence. In the fifteenth century, Nuremberg was the centre of the Holy Roman Empire and a city of extraordinary wealth, based chiefly on commercial connections that reached across the continent. Around 1484 a desire to expand those connections drew him to Portugal, which, in a quest to circumvent the Italian and Muslim middlemen who governed Europe’s trade with sub-Saharan Africa and lands to the east, was sponsoring ever more ambitious voyages down the west African coast. Behaim joined a small but growing community of German traders in Lisbon, where he had occasion to communicate directly with merchants and explorers and even to take part in journeys himself. He took part in at least one of these journeys himself, although he seems to have vastly exaggerated his own part in it. Although he was a dilettante voyager and geographer who greatly exaggerated his own role in these voyages of exploration, he nevertheless impressed Nuremberg leaders with his worldliness when he visited his hometown in 1490. On the advice of Georg Holzschuher, they commissioned Behaim to produce a globe that included the recent Portuguese discoveries. He completed the globe with the help of the painter George Glockendon in 1492, just before Columbus landed in the Americas. Although based on an incomplete and inaccurate survey even of the existing sources of the day, Behaim’s globe is nevertheless a fascinating snapshot of a shifting but still very incomplete worldview. Fantastic and fabulous creatures vie for space with depictions of economic products and raw materials that might interest Nuremberg traders. Of particular note for our purposes is a clear eurocentrism; Christian rulers are seated on thrones, while in the rest of the world rulers sit in nomadic tents, and Black rulers and subjects in Africa are mostly naked. Behaim also took a particular interest in the legends of the Three Kings and Prester John. 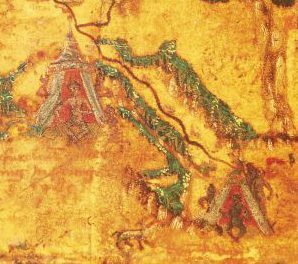 He locates Mount Vaus and the homelands of the Three Kings, all depicted with light skin although the King of Tarsis has a banner featuring three Black heads. He places Prester John in a central Asian “land of the Moors” but also identifies wide stretches of land in India, China, Southeast Asia, and East Africa as subject to his rule. The image above comes from a facsimile produced in 1908 by the geographer Ernst Georg Ravenstein. It makes it possible to see details that are otherwise too faded to make out in the original. 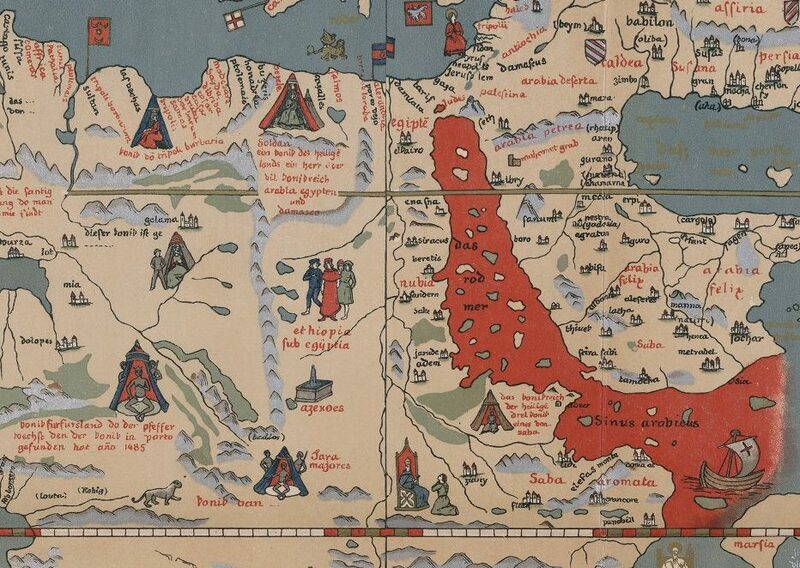 Note the homelands of two of the Three Kings, one in Sheba/Saba on the Red Sea coast and the other in the red tent on the Mediterranean coast. Prester John appears seated in the throne ruling over the kingdom of Abassia/Abyssinia, and the westernmost Black ruler–clothed only in a loincloth–is identified with trade in an exotic sort of pepper. The Portuguese trading vessel sailing off to the east gives little indication of how Europeans’ entry into these trading networks would up-end them. Sources: Martin Behaim and George Glockendon, Erdglobus (1492/1494), Germanisches Nationalmuseum Nuremberg, WI1826; Ernst Georg Ravenstein, Martin Behaim, His Life and His Globe (London: George Phillip, Son & Nephew, Ltd., 1908), David Rumsey Historical Map Collection. Martin Behaim’s globe (1492) by Jeff Bowersox is licensed under a Creative Commons Attribution-ShareAlike 4.0 International License.